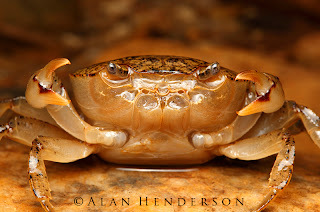 A little while back while searching for trapdoor spiders in the dryer open forest west of Kuranda I discovered an animal that I certainly didn’t expect to – a crab. The crab was living about 400mm underground in a burrow not dissimilar to that of trapdoor and wolf spiders, only that it lacked silk lining. The burrow was about 30 metres from a dam and was within heavy clay soil. 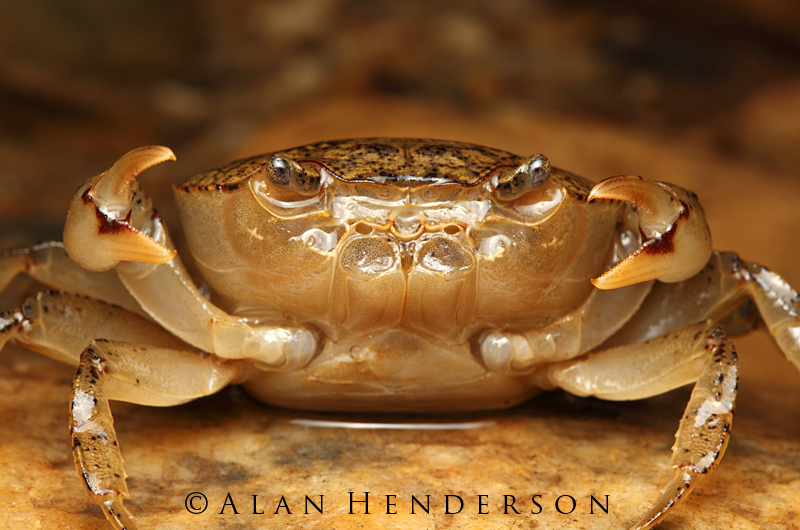 The crab is most likely an Inland Freshwater Crab, Austrothelphusa sp. – crabs that are well adapted for dry conditions. They can cope with extended drought conditions of up to 6 years and can survive sealed in their humid burrows until rains come. During this time they apparently can lose up to 50% of their body water and still survive. I have recently visited the site again, and the area is now under water. This time I was able to find them in a more conventional way – in the water with a net!